Richard Achor, a part-time administrative assistant with The Murphy Theatre, fielded phone calls Wednesday from people requesting to reserve seats for the June 27 free concert by the Jazz Ambassadors of the U.S. Army Field Band. Coming to Wilmington on Saturday evening, June 27 is the Jazz Ambassadors of the U.S. Army Field Band. 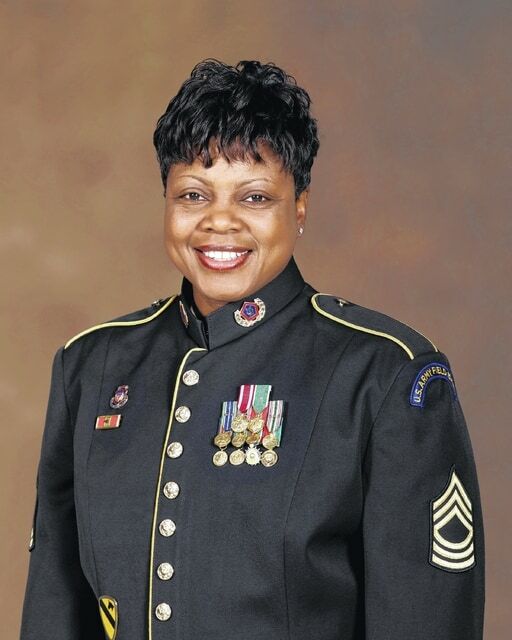 Master Sergeant Marva Lewis of Texas is a vocalist with the Jazz Ambassadors. WILMINGTON — An upcoming concert by the Jazz Ambassadors of the U.S. Army Field Band is free, but audience members will need to have tickets. The 7:30 p.m. Saturday, June 27 event will be held at The Murphy Theatre, and theatre organizers anticipate a full house for the official touring big band of the United States Army. Concerts by the Jazz Ambassadors are designed to entertain all types of audiences, states the website of the U.S. Army Field Band. Its repertoire includes big band swing, bebop, Latin, contemporary jazz, standards, popular tunes, Dixieland, vocals and patriotic selections. The 19-member ensemble was formed in 1969. The band has appeared in all 50 states, Canada, Mexico, Japan, India and in Europe. Master Sgt. Adam Getz told the News Journal the concert in Wilmington will last about 90 minutes, and there will be a 15-minute intermission. It will be the Jazz Ambassadors’ first concert in Wilmington, said Getz. Getz, who handles scheduling for the group, came to Wilmington and met with Murphy Theatre organizers. “They’re great folks. It’s a beautiful theatre and a very nice town,” he said Wednesday. To reserve seats, people can go online and visit the website www.themurphytheatre.org and pick the location of their seat or seats by using a seating chart of the theatre. People also can call the theatre’s box office at 937-382-3643 between 10 a.m. and 3 p.m. on Wednesdays and Fridays to reserve seats. People then can pick up their reserve-seating tickets starting about an hour before the 7:30 p.m. concert. Reserve-seat tickets will be available at the will call window at the free-standing ticket booth, located in front of the theatre. The Wilmington News Journal is a presenter of the Jazz Ambassadors’ event in Wilmington in partnership with The Murphy Theatre. In 1995, the Jazz Ambassadors performed in England, Wales, Belgium, Luxembourg and the Czech Republic in commemoration of the 50th anniversary of the end of World War II.